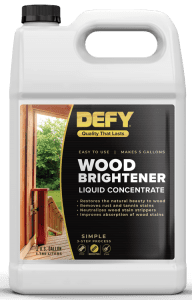 – Defy’s wood brightener applies very easy with a pump sprayer. No issues with clogging the sprayer. There was no need to scrub or wash the wood after applying. Just rinse with water to remove any residue after 15 minutes of activation. – Easy to apply, brightens immediately, low cost per square footage. Everything a wood brightener should be. 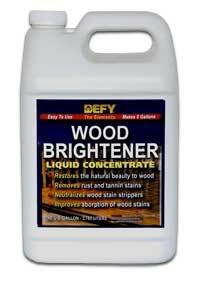 Defy Wood Brightener is an excellent choice! Product Type: Concentrated Wood Brightener. Oxalic Acid Mixture. Just had a redwood fence installed and want to know the best course of action to keep it looking great. I’ve been told cleaner and Brightener, then to add a sealer. What’s your recommendation? I scrubbed my deck using water and tide, is it still necessary to use a brightener? If so, is a sprayer the only application method? Thanks. Yes, and it should be sprayed for best application. I am looking for a product to seal and brighten up the look of a composite deck – it is faded and looks good when wet – looking for that appearance. Others have said your sealer will not change the look, but this brightener may. Upon reading, it seems this is only for full wood – to clean and brighten. Does Defy make any product that will give me a stronger wet look on composite decks? Sorry but sealers do not “enhance” the grain of the composite wood. Brighteners have no effect on composites. Nothing will do what you are looking for. I’ve just gone to a lot of work to remove a 2 or 3 year old coating of Thompson’s water based semi-transparent stain – on a 12 year old deck in Atlanta, PT pine. It looks very good now. I used the Behr brand stripper from Home Depot, and immediately afterwards I used the Behr wood cleaner, at their recommendation, to neutralize the stripper action. I want to now use a TWP 100 series oil based semi-transparent stain. Having used the 2 step treatment by Behr, is it worthwhile to also used this Defy wood brightener? Sounds like it does about the same thing as the Behr cleaner, but I want to make sure the wood is in great condition for the TWP. Also – does the Defy product have to scrubbed after applying, or is it ‘spray on and rinse off’? Thanks! Behr Cleaner is not a brightener nor is it a neutralizer. They gave you bad advice. Best to apply a wood brightener to neutralize before staining. Brighteners are not scrubbed. Just apply, wait, and rinse. Correct. Formula changes through the years. Current Behr Deck Cleaner formula is “acidic” based so yes, it will neutralize. Have new deck of KDHT-SYP. Near all day sun exposure in hot & humid climate. I plan to stain with WoodRich Timber Oil (IF I can find a trustworthy seller; that seems to have been a problem for many). I hope to stain in about a month (yes/no?) subject to weather, and water droplet test. Clean and brightening prep should also wait until a couple days before staining – correct? I was leaning toward Restore-A-Deck brand for prep, but I see in your review of Defy Brightener, it specifically mentions removing mill glaze, which is not mentioned in the Restore-A-Deck reviews. Which brand do you recommend for new wood? Why would brightener remove mill glaze – shouldn't the mill glaze have been removed in the cleaning process? I will do some light sanding on a few rough spots, should I go ahead and sand all of it before cleaning? Yes one month after the prep will work. Both the RAD products and the Defy products will remove mill glaze during the prep. You will have to sand off the stamps first. Do that now then let it sit for a month. Same with the rough spots. Can i use this on my Wood Fence? If so what are your suggestions prior to using. My fence is probably about 4 years old. I have never cleaned it. So should I use a pressure washer then apply this product? Sorry I really have no clue. Drew, you use the Defy Wood Cleaner first, lightly pressure wash, apply the Defy Brightener. You can use it on a fence. I learned about oxalic acid in the Coast Guard almost 40 years ago. It's an excellent brightener, and has served me well in deck cleaners ever since. I also knew decades ago that bleach damaged the wood, but my wife persuaded me to look into using both, so I could eliminate mold/mildew stains. I'll go with your recommendation of sodium percarbonate instead of chlorites. Thanks! I have a 2 level PT lumber deck that is at least 17 yrs old (one deck is 20 x24, the other is 14 x16). I have powerwashed (used a deck wash solution from Lowes (can't remember brand) and sanded the entire deck with a palm sander, and am getting it ready for staining. Thankfully read your site and will use your recommendation of TWP 1500. My question is, after having sanded both decks (used 80 grit paper), should I use a brightner before applying the stain, or do I need to do something else to get rid of the dust from sanding? Also, if I use the brightner, how many days should I wait before I stain? Thanks for your help! Maria, yes I would apply brightener and heavily rinse the deck before staining with the 1500. Wait 48 hours. My deck has been power washed, and I have the DEFY brightner and stain, but I'm concerned about trying to get this done before the weather cools and also the predicted rain just about every day, albeit only "10% chance" on some days. Could I use the brightner and then wait until I get a reasonable dry spell, even it it's a week or two later? Mary, waiting a week or so would be fine.